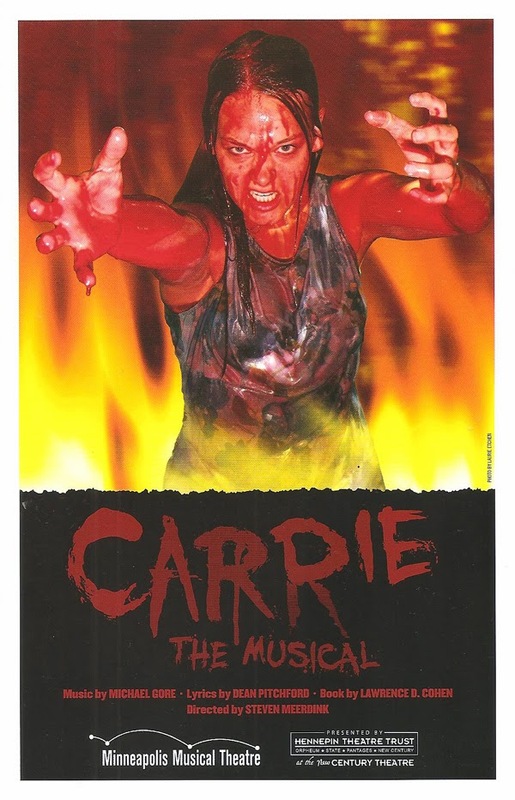 The original musical adaptation of Stephen King's novel Carrie was a notorious flop. It closed after just 21 performances on Broadway in 1988 and was never heard from again... until the original creators significantly revised the script and score for a 2012 off-Broadway revival. This new version set in the present day, with kids attached to their smart phones, enjoyed a much better reception from critics and audiences. This year, successful productions of the revised Carrie have run in San Francisco and Seattle, and at the New Century Theatre in downtown Minneapolis. Minneapolis Musical Theatre, whose mission is to produce little-seen musicals, has chosen Carrie as the first show in the 2013-2014 season (which concludes with one of my recent favorites, Bloody Bloody Andrew Jackson, next summer). While I wouldn't call it a great musical, it's energetic, at times compelling, and certainly timely (unfortunately, bullying hasn't gone away since King wrote about it in 1974). And the raw young talent on the New Century stage makes it work. Even those of us who've never read the book or seen the movie are familiar with the story - a sheltered teenage girl is bullied relentlessly by her peers, culminating in being crowned Prom Queen, when a bucket of pig's blood is dumped on her head. Her rage and humiliation fuel her telekinetic powers to wreak destruction on everyone and everything in her path. The events begin when Carrie (Jill Iverson) gets her period in the shower at gym class and freaks out because she doesn't know what's happening to her (a little harder to believe in 2013 than 1974). All the girls laugh at and tease her, and you get the sense that this isn't the first time Carrie has been laughed at and teased. The two popular girls have different reactions to the event. Sue (Natalie Schleusner) feels guilty about the way she and her friends have treated Carrie, and sees the humanity in her. She asks her boyfriend, the sensitive Tommy (Philip C. Matthews), to take Carrie to the prom so she can have a fun night. In contrast, Chris (Rebecca Gebhart) hates Carrie even more when she's punished for the event and not apologizing for it, and enlists her boyfriend, the dimwitted Billy (Logan Greene), to help her with the infamous prom blood-bath. At home, Carrie's mother (Lori Maxwell), who has suffered something in her past that's only hinted, is fearful of the world and longs to keep Carrie home with her. She's alternately loving and terrifying as she punishes Carrie for being too worldly. Despite the abuse, Carrie loves her mother as the only person she can confide in, other than the gym teacher who befriends her (Amanda Weis). But sadly, even Miss Gardner can't stop Carrie from being ultimately humiliated and taking her revenge. There are some great songs in the score, and also some cheesy ones. The best are the ensemble numbers, staged by director Steven Meerdink with a Spring Awakening feel, full of youthful angst and energy. Carrie also has some beautifully poignant songs as she wonders why no one calls her by her name, and ponders the idea that maybe she can be "normal" too. The young and energetic cast ably perform the material, and Jill Iverson is the heart of the piece in her extremely sympathetic portrayal of this picked-on girl, hair hanging in her face and eyes darting as she belts out her torment in song. It's so hard to watch these portrayals of bullying and try to understand why kids are so mean. But sadly, Carrie's story is not unique. I find it tragically ironic that Stephen King's story is seeing a newfound popularity (there's also a new remake of the movie) just weeks after a 12-year-old girl jumped to her death after being bullied by a group of girls. 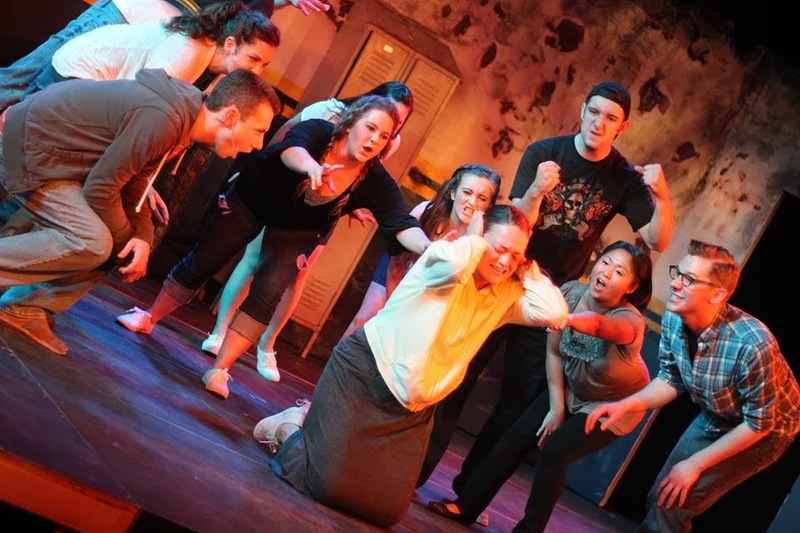 Carrie: The Musical deals with this very serious issue in an over-the-top way with music and dark humor, but also with sensitivity and poignancy. Only one weekend of performances remain if you'd like to see for yourself.